CCE-W - Cleansing Corrective Extract, Beneficial for the relief of occasional constipation. * (Aloe, Angelica, Manna, Milk Thistle, Myrrh, Senna, Spikenard, Turkey Rhubarb, Turmeric ). ccew. 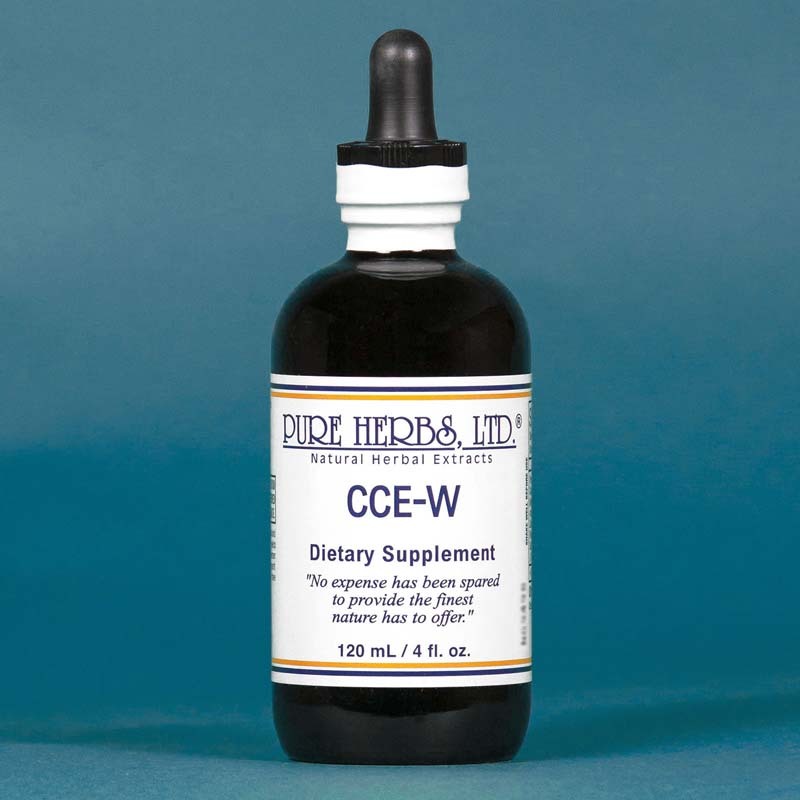 CCE-W(Cleansing Corrective Extract) - BASIS FOR ALL NUTRITIONAL PROGRAMS; cleans blood, bowel, nerves and repairs them. It is a life extender. C.C.E.-W is an antibiotic, a poison antidote, and an outright corrective for numerous common and many baffling types of conditions. Its antibiotic activity is excellent. Poison antidote for bee stings and insects. Take internally and apply externally, as needed. For severe itching conditions, such as chicken pox, paint C.C. E.-W on the areas with a Q-Tip or Cotton Bud to relieve the torment. Also, take for allergic reactions. For emergencies, or in a crisis condition, 1 ounce (1 standard measure Tablespoonfull) can be taken at once. If a flu is threatening, take 1 Tbl. to prevent it or if it is in full progress, take 1 Tbl. full every four hours, while awake, until the symptoms go away and stay away and get through the flu in record time. It would be unusual to have to take C.C. E.-W more than 3 times in one day. Many times, in the early stages of a flu, 1 Tbl. will just wipe it out. If needed to counteract a persistent threat, take 1 Tbl., or more, until the flu no longer threatens. If a baby or small child objects to the taste, or if the person is bedridden and cannot take by mouth, then rub in sufficient quantity to cover the entire abdomen instead of taking internally. Please Note: you will clean out large quantities of solid and liquid wastes, rapidly, which are the cause of the flu. Every time you flush these wastes away you can see what was tormenting the body and causing the flu. C.C.E.-W is also an excellent daily regimen to keep the body clean and avoid many kinds of problems. C.C.E.-W is normally taken daily, such as each night, as part of a bowel maintenance program. Take (mercifully in juice) each evening in sufficient quantity to produce at least 2, and preferably 3, bowel movements per day. This may not be a "civilized" idea, but is a good health idea and "good habit". In so called primitive societies, where there are an abundance of natural foods and fiber, there are (on an average) 3 bowel movements per 24 hrs. In these societies, they simply do not have many of the "dis-eases" we suffer from in modern "civilized society": the hemorrhoids, the skin conditions, hypertension, the allergies, the etc., etc., etc.. They don't even have names for them. The concept here is, when you put something into the body, then you should evacuate something so the wastes do not back up and cause a breeding ground for putrefaction and "dis-eases". By observation of healthy functioning systems, such as with a new born baby (unpolluted by junk food), if you feed the baby, then be prepared to diaper at the same time, or if you feed the dog (unless you feed him the same kind of food you are eating) then you must be prepared to walk the dog. If there are 3 meals per day then we want 3 bowel movements per day. Then, most of the hysterectomies, prostate operations, yeast miseries, bowel cancers, eczema, psoriasis, parasite problems and fully 1/3 of all the "dis-eases" listed in medical books can be avoided. Remember here, the time honored wisdom: "Miseries missed are blessings received too". NOTE:There are many types of cleansing corrective combinations around. This is one of the most common and best. * COMBINATION:Aloe, Angelica, Manna, Milk Thistle, Myrrh, Senna, Spikenard, Turkey Rhubarb, Zedoary. DOSE:10 to 80 drops each evening. For more involved conditions, up to 1 Tbl., as necessary, to obtain desired activity, for as long as necessary. If you need it, you need it. For a complete bowel maintenance program, take 4 to 6 capsules of Psyllium and 4 to 6 capsules of Alfalfa. Psyllium acts as a lubricating, internal exercising bulk and the Alfalfa as a deodorizing "scrub brush". Be sure to take a large glass of water with the Psyllium so it can do its job and so it does not gum up. For all other uses: use as given above.